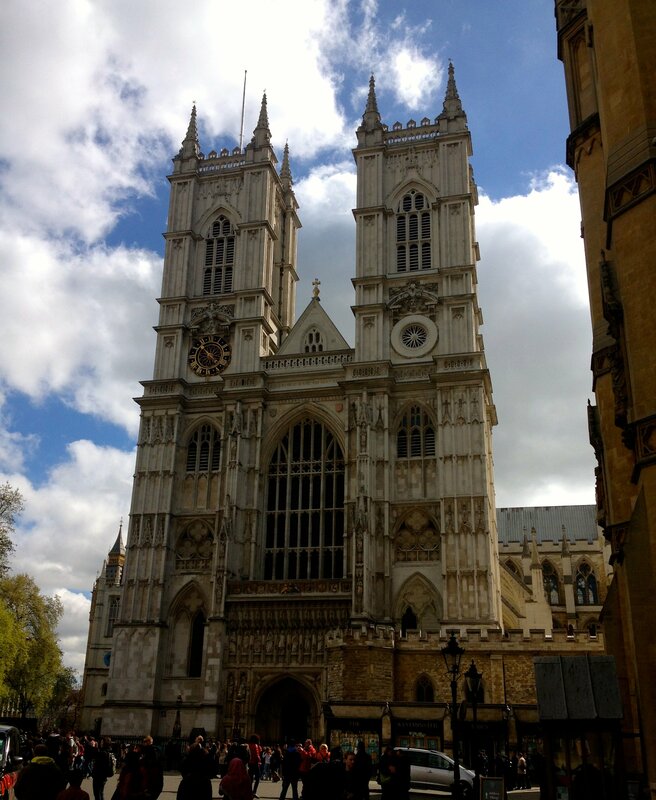 Westminster Abbey is one of the most iconic places in London. Here is our review of the cathedral and what you can see when tour the abbey. We are fairly certain that some kind of monastic community existed on where Westminster Abbey now stands since the tenth-century, while local legend go back even further. The tomb of King Sebert, a seventh-century King of Essex, purportedly lies in the Abbey, but most most historians are somewhat doubtful that these are his remains. Edward the Confessor built a new church on the site, and it was consecrated on December 28, 1065, just a few days before the king’s death. Almost immediately it became the site where English kings were crowned – Edward’s successor Harold Godwinsson probably had his coronation there, and William the Conqueror definitely had his on Christmas Day, 1066. Since the building’s role as a monastery has been overshadowed as a centre of royal power – nearly every coronation of an English or British monarch has taken place here. In the mid-thirteenth century Henry III had Westminster Abbey rebuilt (tearing down everything but the Nave) in the Gothic style. His son, Edward I, added to with a coronation chair, which you can see within St Georges Chapel at the west end of the Nave. The royal connection saved Westminster Abbey from destruction during Henry VIII’s Dissolution of the Monasteries. Until the 18th century it was also the final resting place to many monarchs, including Queen Elizabeth I and Mary, Queen of Scots. – Starting with Geoffrey Chaucer, a section of the Abbey known as Poet’s Corner is the final resting place for many of the country’s greatest literary figures including Lord Byron, Samuel Taylor Coleridge, Charles Dickens, T. S. Eliot and Jane Austen. – Westminster Abbey is also home to the oldest door in England. Located near the Chapter House, the Anglo-Saxon door is dated to about 1050. – Walking through the Abbey you will find many of the tombs and monuments have been marked with graffiti or have had gems and other precious objects removed from them. Some tombs have even had bones removed from them. his damage itself is often hundreds of years old, as some of the Abbey’s countless visitors have decided to leave their own mark on the historical site. The abbey remains one of the “must-see” medieval and early modern venues while visiting London. Make sure to allot time to properly tour the abbey. It’s not something you want to rush through; there is so much to see. We were at the abbey during a particularly busy time so regular tours with a guide were cancelled. If you’re overwhelmed, there is a phone handset tour you can take narrated by Jeremy Irons! It’s the usual as with most touristy places where you punch in a number and you’re given a description and story about the area or object you’re viewing. We found it useful and it’s free. One point to note: there is no picture taking permitted inside the abbey except in the Cloisters, the Chapter House and College Gardens. The reasons given are that flash photography is bad for conservation and picture taking also holds up movement in the abbey when there are large crowds. Lastly, the abbey is concerned about how the pictures may be portrayed or that they may be used for commercial purposes without consent. Don’t despair! This didn’t deter us or dampen our enjoyment of the tour – we still managed to take many pictures in the permitted areas. Believe us, you won’t be at a loss for photos. For myself (Sandra), I really loved the tombs of Mary Queen of Scots and Elizabeth I. Elizabeth’s tomb cost £1485 to erect at the time and apparently, her exact likeness is on the effigy because a death mask was used in its creation. She is the final English monarch to have a tomb erected above her at the abbey. Mary wasn’t initially buried at the abbey but her son, James VI Scotland/James I of England had her moved there in 1612. The details of the tombs are absolutely incredible and works of art. I also loved the raised tombs of the Kings as I walked around the abbey – especially that of Edward I, Edward III and Richard II. It was just amazing to be able to stand next to them. Sadly, you can’t see Edward the Confessor’s tomb clearly, he is hidden away behind others because the area is under conservation at the moment. Poet’s Corner is another “must-see” area of the abbey if you’re a literary fan. I’m an avid reader of English literature so seeing Dickens, Austen and Chaucer’s names there filled me with complete awe. Peter and I were invited to partake in a candlelight Easter Mass and Vigil at the abbey in the evening following our tour. I have to say it was one of my favourite experiences since I’ve moved to England. While surrounded by the tombs of English Kings, Queens, poets, and actors, and the place of coronations and royal weddings, you get to hear the choir sing lovely music. It was like no Mass I have been to before; it was stunning. We were fortunate to have seats directly behind the choir and a good view of the service. The choir was amazing; such beautiful voices. It will remain one of the most memorable evenings of my life. If you are ever given such and opportunity, count yourself lucky. It’s truly unforgettable.